I'm crabby today so I thought I would share some of the things that cheer me up. Warning, this is not a sweet list. These are some of the things that will make me laugh at you, not with you. This is a steer into the skid kind of day. Why fight the crabbiness when you can embrace it? When I see these things, my day gets better! Matching Clothes - I'm not going to lie one of the greatest moments in my life was when I saw a mother and daughter wearing matching outfits and hair bows! Unfortunately for me, I was drinking at the time and a little Diet Dr. Pepper came out my nose. Do not dress like your 4 year old daughter unless you want people to try to take inconspicuous pictures with their iPhone! I failed to get the picture which may go down as one of my biggest blogger failures! And if your clothes match your husband's clothes you might be a NASCAR fan. And you might go to my old church. And I may have made bets with my husband on a regular basis over which NASCAR shirt the two of you were wearing on Sunday. Maybe. But seriously, thanks for the years of entertainment! Falling - Call me immature but if you fall down or run into something I will laugh at you! 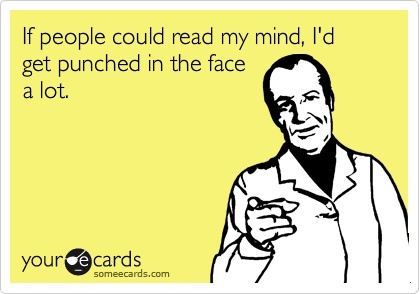 Depending on how well I know you I am also pointing. Today Molly was teasing her twin and she ran right into the wall. I'm such a bad mom I laughed at her. Oh who am I kidding? I'm laughing at the memory of it. People Rocking Out in Their Car - I love seeing someone rocking out in their car. Have you seen the Volkswagen commercial with the guy drumming and going to town in his car? I love it! If I saw that in real life it would make my day. Douche Bag Hair - This one is aimed mostly at the boys out there. If you are 45 years old and you have a faux hawk, I am laughing at you. Openly and I don't feel bad for laughing at you. You're 45, the faux hawk doesn't make you look any younger, just like you're the heir of the Massingale fortune. Men in Super tight V-neck t-shirts - If you also have douche bag hair, I totally laughed aloud! 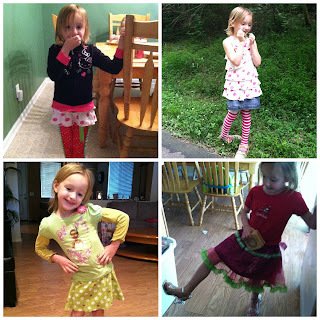 Kids Who Dress Themselves - Mostly my daughter Isabella who is "Punky Brewster" at heart. I love her weird outfits and I take pictures of them! One day this kid will be embarrassed my what I wear and I'll have these picture to keep me happy. I laugh at her outfits almost everyday. I'm pretty sure I'm nailing this parenting thing by allowing her to dress herself while taking pictures of her fashion statements. What makes you laugh at someone? I hope today was better than yesterday! I love seeing the combinations my daughter puts together too. I'm working on teaching her how things match but we're not there yet. Not even close. Oh the matching lessons! My daughter thinks if there are pink dots on her shirt and pink stripes on the tights they match since they are both pink. Pretty logical coming from a 5 year old. The same rule applies for plaid shirts and shorts, as long as they are both plaid they match. It's pretty funny seeing what she comes up with most days. I know I'll miss this phase when she gets older.